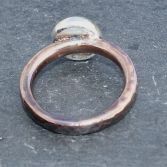 My Copper with sterling silver Pebble is made from 3mm round copper which has been hammered and textured then soldered together. The Pebble is made from solid sterling silver which has been made by melting sterling silver to form the pebble. 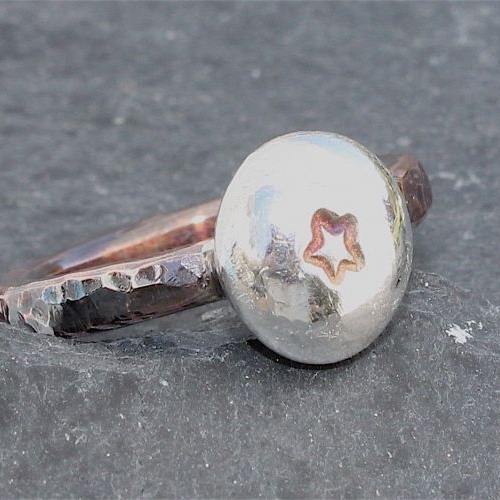 I then give the pebble a little star detail and solder it up on the top of the ring shank. 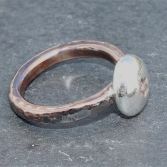 The ring is then given a high polish and a patina is added to show off the hammered textures of the copper. This item is made to order, so allow 3-5 working days for delivery (i always try to get it to you sooner than this) please select ring size using the drop down option below. 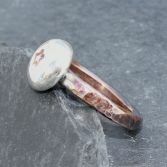 If you would like a different detail such as a Heart or a Letter stamped on your pebble ring or no detail so the pebble is just plain then just email me at julie@juliebrandonjewellery.co.uk. Or leave special instruction at checkout. Your Copper With Silver Pebble Ring will be presented in one of my gift bags and placed in a padded envelope and posted via Royal Mail 1st class delivery (signed for) to any UK address free of charge.